It’s staggering to think about. It’s nearly impossible to imagine. Human beings look back in time every night. Every night we look up at the heavens. The stars we gaze upon are thousands of light years away from us. By the time the light from those stars reaches our eyes, what we see is a remnant – a snapshot – from the past. The mind-boggling photos from Hubble show the births and deaths of stars and solar systems and planets, but the pictures we see are not as they are in our present. I remember the first time I grasped this concept and how enthralling and heart-stopping it was. I have always been consumed on some level with the universe and astronomy. In no small measure this was due to the enthusiasm of my father and uncle. As a child we’d look up at the Moon with a basic telescope and I could not believe how clearly you could see the craters on the Moon’s surface. We’d follow satellites with flashlights in the deepest, darkest night while camping. They’d talk to us about the statistical reasoning behind the assumption that we are not the only intelligent beings living and breathing and blogging…in our galaxy, let alone the universe. They tried to explain the theory of the expansion of the universe, but alas I still can’t quite wrap my head around that one…how can everything that exists expand into nothing that doesn’t exist? All of it, every bit of it, is wondrous to me. One night when I was around 10 years old, my father and I were sitting on the front porch on a warm, summer evening. We talked about the stars and he reminded me that because we lived in a city what we could see was “nothing”. He wanted me to remember the night we were driving home through a very rural area from a party, and how he stopped the station wagon on a lonely little road next to a field and opened the back hatch. My sister and I were sleepy, cranky. Remember, he said, that I told you all to be silent, and to just look…up. And he reminded me that we gasped “wowwww” and were indeed silent. And he reminded me that the sky was nearly white from the brilliance of the stars and planets and star-dust, to the point where you almost couldn’t see the blackness of empty space. And he reminded me that even that particular night couldn’t convey the enormity of what lay beyond our planet. I told him I remembered. There was a breeze, a beautiful night on the porch. My father then pointed to the schoolyard across the street. “You see over there?” he asked. “If a spaceship from another planet landed there and asked me to go with them, but I could never come back…I would go.” He said matter-of-factly. “What?? ?” I was stunned. Hurt even. I didn’t believe him and I argued with him that ultimately he would do no such thing. He explained to me that he would forever miss me, my sister and mother…everyone he knew and loved, but that he simply could not – would not – pass up the opportunity to see things that no human being could even begin to imagine. It upset me a great deal to hear that from him, but even then I understood it in some small way. We are but specks. I knew it then and I know it now. As a child might say, we are Horton’s Whos. While most rational-thinking people can believe that we are almost certainly not the only intelligent beings in the universe, we still have no proof that we aren’t. We keep looking, searching for evidence that we aren’t floating around – all alone – in the blackness of everything that ever was or will ever be. If I think about it long enough, it’s terrifying. I don’t want us to be alone. No one wants to be alone. There are but a mere handful of human beings who have gone into space and were able to see with their own eyes the Earth, and an even smaller handful of human beings who have walked on land belonging to another celestial body and gazed upon the Earth. What must that be like…feel like? Clearly the pictures they take help convey to us the grandeur of our planet, but I think in no way can they adequately instill into us our…aloneness. I will never understand why human beings as a whole do not seem to comprehend this. Why don’t we? As far as we know…know…we are alone in all the universe. We’ve created religion to help sedate our fear that there is no rhyme or reason to our existence, that we’re not all just happenstance and the blind-luck of molecules and atoms and proteins converging in just the right proportions. I believe in God, I feel God…and I don’t think believing in God and science are mutually exclusive. But I do believe that “religion” as a concept was given birth to by people who wanted to feel as if there was a “father” taking care of us, somewhere…just out of sight. Children do not like to be left alone. Even if they can’t see you, they want to believe you are there – ready to help them, comfort them, save them. All you have to do is look around. In a world filled with so much beauty and wonder and love, there exists so much destruction, and sadness and war. I know, I know…it’s so “hippielib” of me to say…but really…why?? We kill and hurt each other over land and money and oil. We destroy with callous disregard the very place we live. And much of what we fight and kill each other over harkens back to God, and religion, and ideology; which God is the right one, the RIGHT protector and creator? Which God should we put our faith in? If it’s the “wrong one” you’re penalized over your poor choice. What are we doing? All we know is each other. All we have are the other finite number of human beings on this planet. This Earth is our only home. Why can’t we accept, that for now, maybe forever, this is it…that everyone we know and everything we see around us is all we get? How can we not take care of it all and each other as if we are each others protectors? Instead of putting our faith in only God, or only in the hope that we are indeed not alone in all the universe, where is the faith that we can take care of each other? I am struck by the similarities of the statements from astronauts all around the globe who have been uniquely privileged to see our planet from the vantage point of space. share in our world are far more valuable than those which divide us. human drama and comedy. That’s where life is; that’s were all the good stuff is. meant until I saw Earth from space. 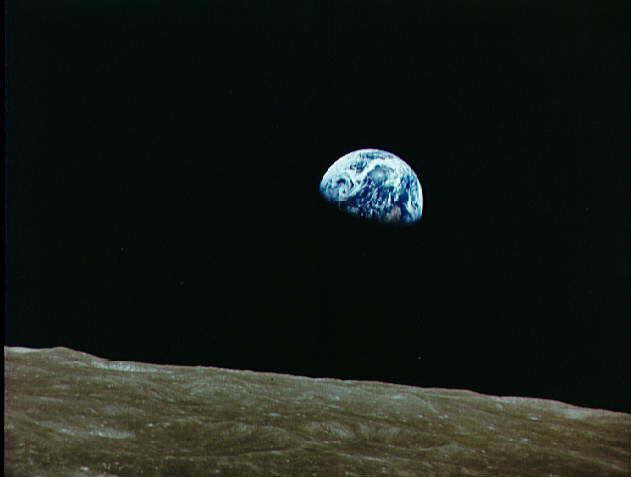 The Earth reminded us of a Christmas tree ornament hanging in the blackness of space. told it was so many times in my life. I was terrified by its fragile appearance. first time. I could not help but love and cherish her. The world itself looks cleaner and so much more beautiful. Maybe we can make it that way – the way God intended it to be – by giving everyone, eventually, that new perspective from out in space. They speak of our fragility, how we must cherish this tiny little speck of a planet, defend it, and how seeing it from above instilled in them a sense that divinity must have played a hand in our creation, so awesome and inspiring it was. I believe that every single leader of men and women and nations should be made to view Earth from above. No, not just from above…from the Moon. They should be made to stand alone on our beautiful yet lifeless satellite and view the only home the entirety of humanity has ever, ever known. And in utter, catastrophic silence take in our complete, as yet unproven…aloneness. They should be made to watch, and listen, in staggering awe until they feel…faith in humanity. A faith perhaps born only when one realizes that there is quite literally – no other option. Who then might become the protector in their eyes? How then will they feel about killing and war and destruction? How then might their instincts to “take care”, no matter how small at the outset, expand exponentially? I hate the thought of a young girl somewhere on a distant world looking through her telescope with her Dad, the light from our planet finally reaching her eyes…from a time gone by…and thinking how beautiful a light it is – not knowing it was snuffed out long ago. And that we did it to ourselves. Posted in astronomy, faith, humor, universe and tagged astronaut quotes, astronomy, divinity, Earth, faith, God, Hubble, human beings, humanity, killing, Moon, planets, religion, space, stars and planets, war. Bookmark the permalink.